Centre Francophone director Lionel Cuille with students and guests for "Iran-U.S. Relations: Impact for Human Rights"
Webster University's Centre Francophone, in partnership with the Cultural Services of the French Embassy, hosted the conference, "Iran-U.S. Relations: Impact for Human Rights," with guest speaker Fariba Hachtroudi, a native of Iran, on Feb. 15. Hachtroudi discussed the importance of Francophonie culture in Iran and shared her personal experience traveling clandestinely to Iran by way of the desert of Baluchistan. She also discussed the effects of totalitarianism and the relationship it has created between Iran and the United States. The event drew Webster students from International Languages and Cultures as well as the International Relations and International Human Rights programs. Webster students Olivia Potter and Angela Meng, both majoring in International Relations, introduced Fariba and spoke of her upcoming novel, The Man Who Snapped His Fingers, a novel that explores power and memory by an important female writer from a part of the world where female voices are routinely silenced. They thanked her and Left Banks Books for the opportunity to have such a voice heard at Webster. Hachtroudi's inspiring story and work in human rights left an impact on students like Potter, who plans to become an attorney and work in activism in the future. "Fariba makes you feel like you’ve known her your entire life," Potter said. "She’s inspiring. Women like her make real change." Hachtroudi also discussed journalism in France and the United States, and how much the rise of the Internet has influenced journalism around the world, for good and for bad. The internet, she feels, is an important platform for having your voice heard, but can also be harmful to those Iranian women, like herself, who aren’t allowed to have a voice. Clearly, her work is helping others who are determined to enable more voice in human rights. 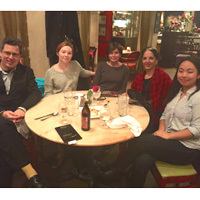 After dinner with the students, Centre Francophone director and Webster professor Lionel Cuille, and Cindy Maars of the Alliance Francaise de St. Louis, Hactroudi casually handed Potter her business card and said, "Call me when you're in Paris."